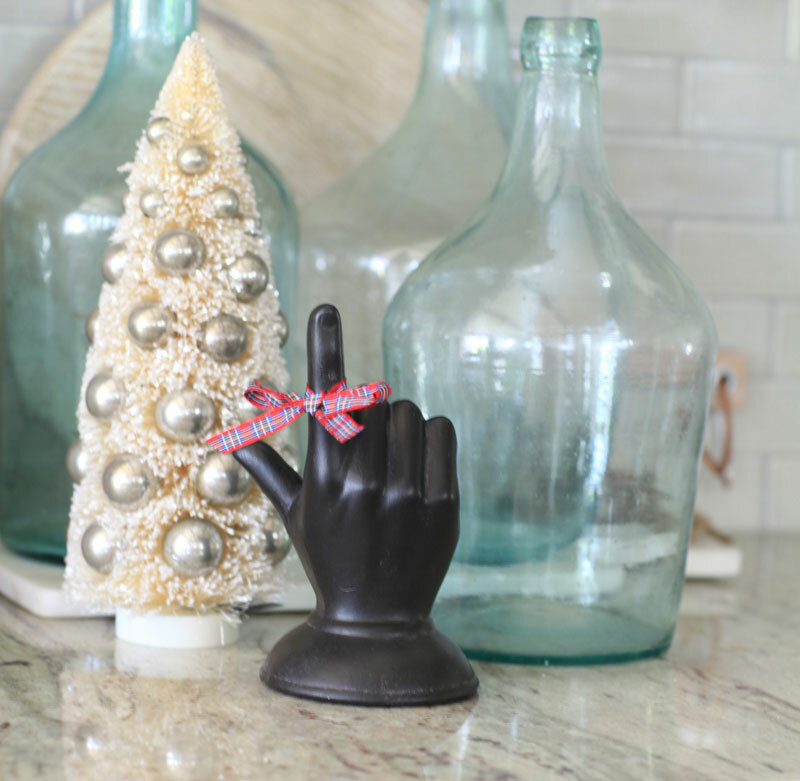 Today I am joining the bhome bloggers for a Christmas event. I love seeing everyone’s amazing Christmas decor every year. The talent is so amazing! I do hope you’ll check out the other homes on this tour. You’ll find them at the bottom of this post. 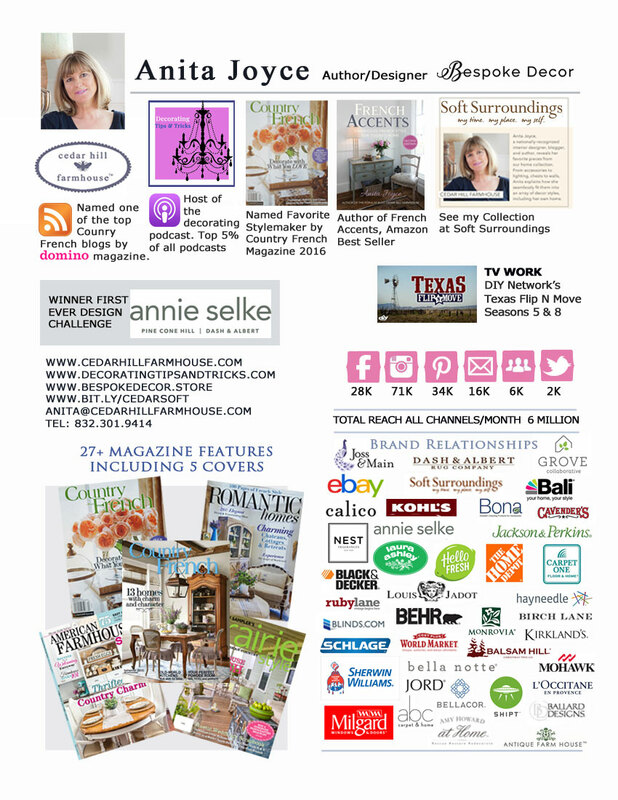 In case you missed it, Part I and Part II of this year’s home tour can be found HERE and HERE. The theme this year is Outlander! I set up a table that I thought would be so pretty for Christmas. Although I do have Christmas plates, you know the Spode ones with the Christmas tree on them, I decided to do something different this year. 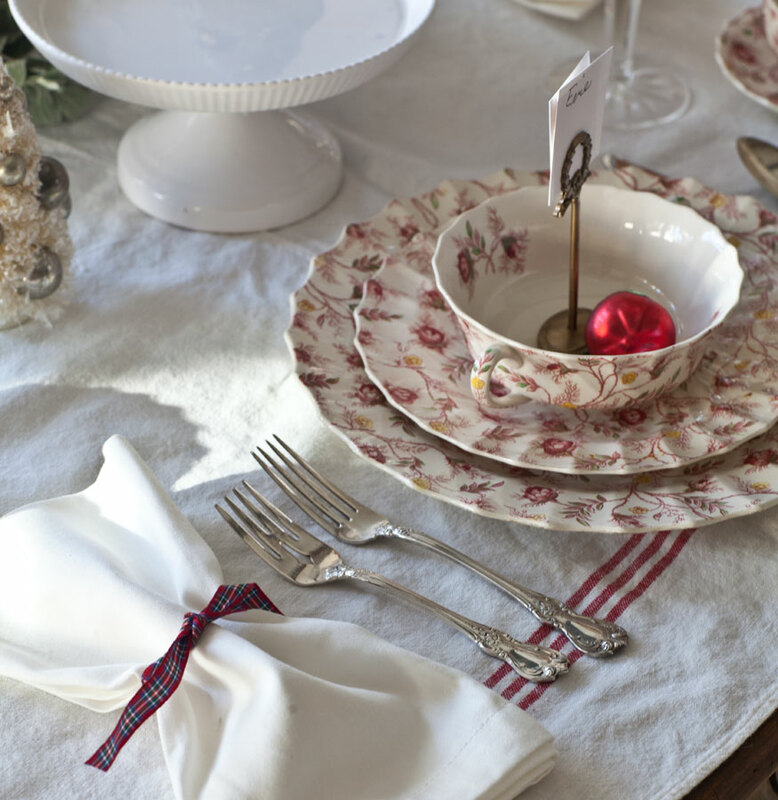 I am using my Spode Rosebud Chintz plates since they are red with a bit of green. I also used some white dishes with a bit of greenery on the table. 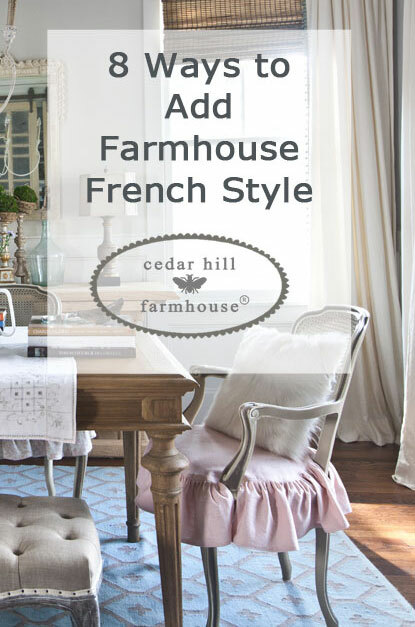 The tablecloth is a vintage one that didn’t sell at Round Top. Then I get attached to it, and decided to keep it. I love this charming butter dish below that my friend Peggy gave me. It’s adorable. She’ll be perfect for Christmas! 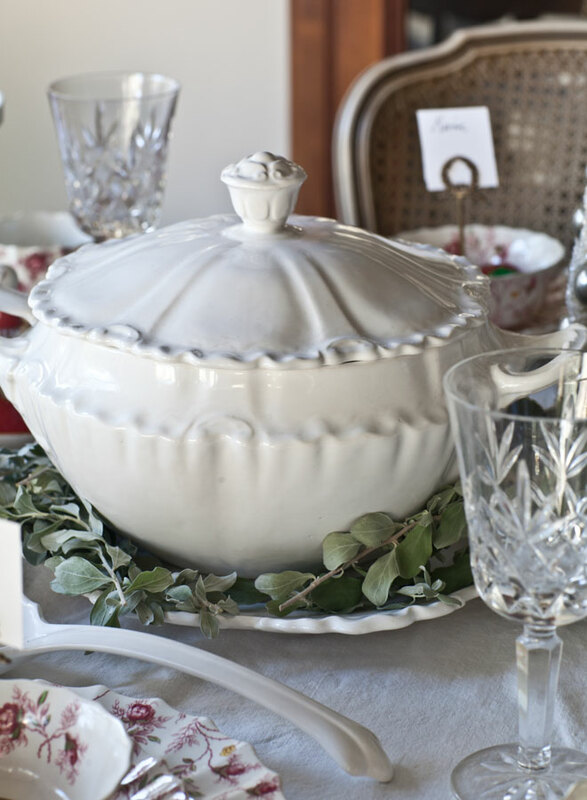 The tureen is a find from the thrift store. I think it’s gorgeous and it was very reasonably priced. The greenery around the base is from my yard. For each place setting, I used a little holder for the place cards, and put an ornament in each cup. Then I used some of my red tartan ribbon to tie around the white linen napkins. The silverware is inherited. 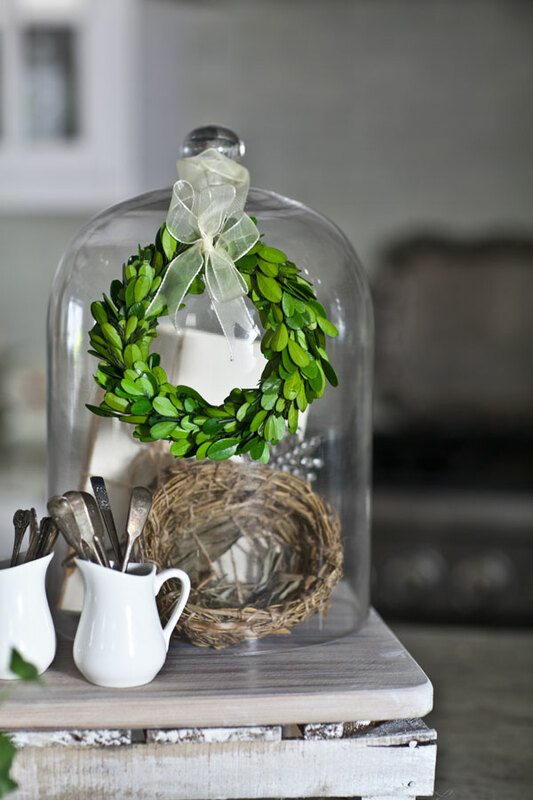 I also used these little boxwood wreaths that I am obsessed with this year on the cloches. Inside the cloches I used some birds nests and moss. The natural look is in keeping with my Scottish theme. The birds’ nests are actually not real. I have tried using discarded birds’ nests that are real, but they tend to fall apart very easily. Birds are not thinking long-term apparently. I found this little tree in with my Christmas stuff and thought “What the heck?” Then I realized it was a Charlie Brown tree that someone gave my husband a few years ago at the office. So I thought, what the heck, I’ll set it out. 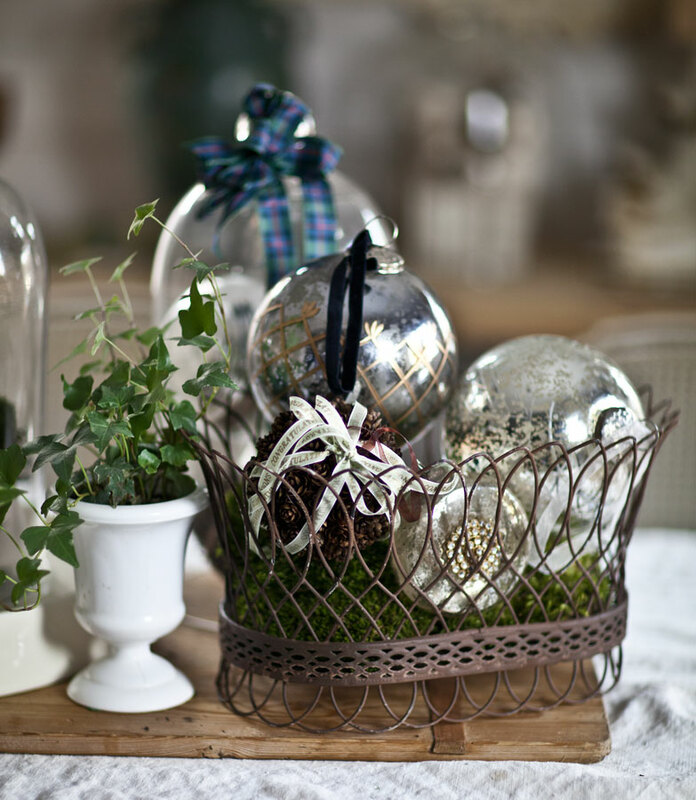 Here I added some silver oversized ornaments to a French wire basket. I actually have two of these baskets, so I thought I would show them together, but for this table, I like seeing the one by itself. 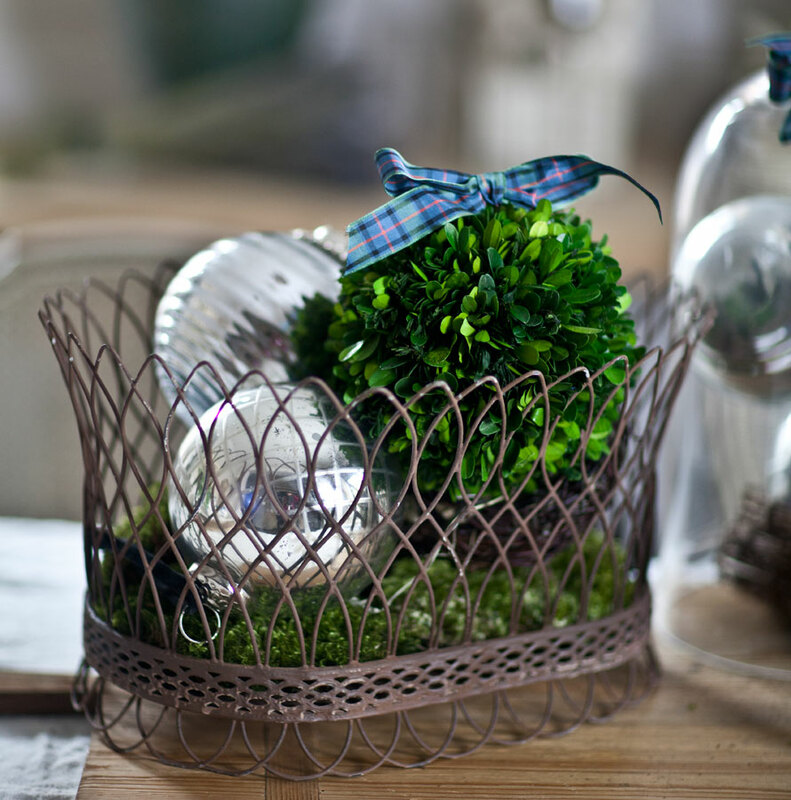 The basket is lovely by itself, but I really love it filled with these oversized silver ornaments. Here is my little reminder to remember what the season is for. It’s about the birth of Jesus, and not about extravagant Christmas decor. 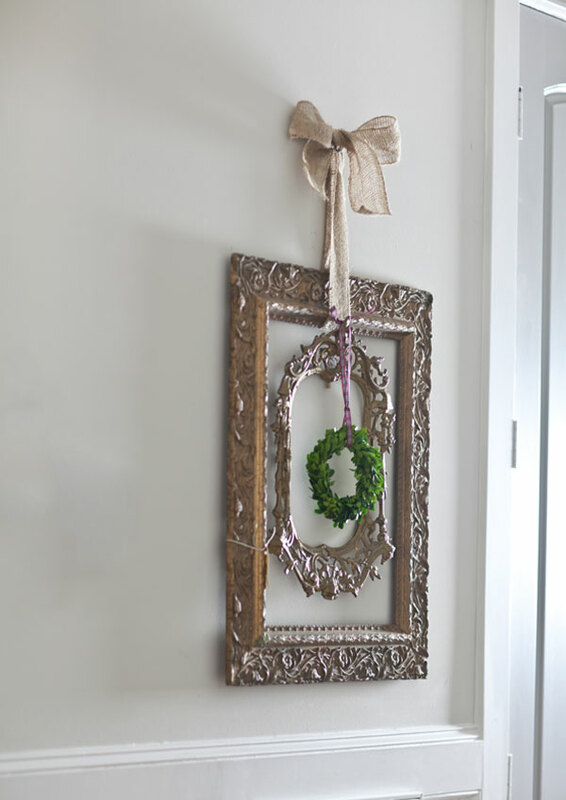 Here is a wreath inside two very old frames. I didn’t do much here, but I wanted to show you these awesome old milk pitchers from the thrift store. I think they are so lovely they just didn’t need much of anything. Again very simple, but here I just added a few trees to my ironstone pitchers. I added more greenery from my yard to a grouping of old pitchers. 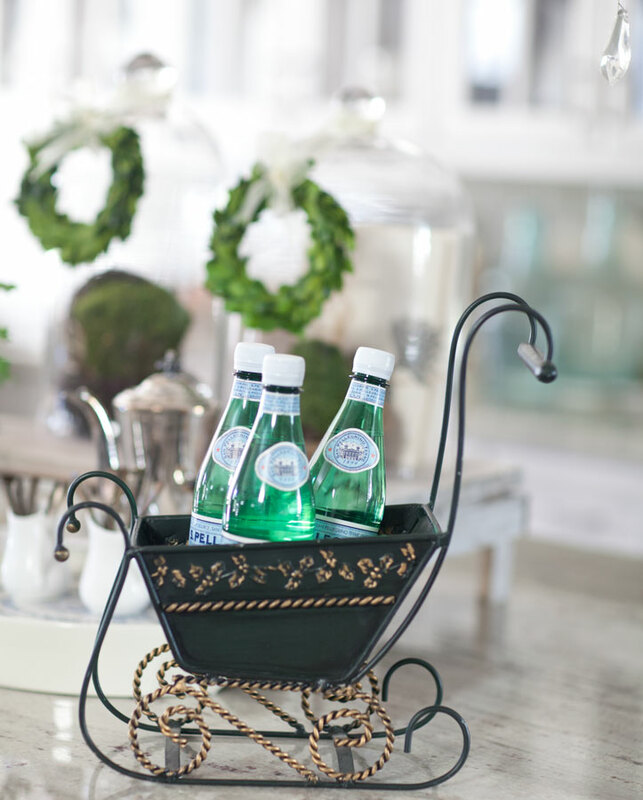 For any guests stopping over, I’ve go Pellegrino water in the sleigh. And finally more bottle brush trees in these fabulous wood planters. Well, I hope you enjoyed my little touches of Christmas in the kitchen. 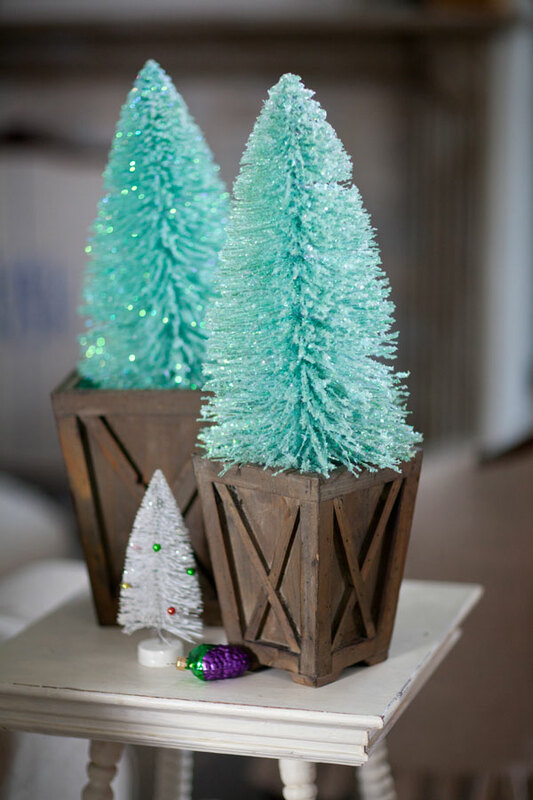 I know you are probably here for some ideas for Christmas decorating, but I do hope you have time to sit and enjoy time with your family and friends. I hope you have time to reflect on the reason for the season. Between what I have going on with my mom who just had a heart attack, visiting her, then helping my daughter prepare for finals things have been crazy here. My other daughter who has Down Syndrome, is finished with school and I have been working to get her into a day program with employment assistance. Until then, I don’t have any help with her until late in the afternoon. Meanwhile my tub is not usable because the plumber hasn’t been able to locate the part, then my daughter flushed when he had the taps off so some water came down through my ceiling. 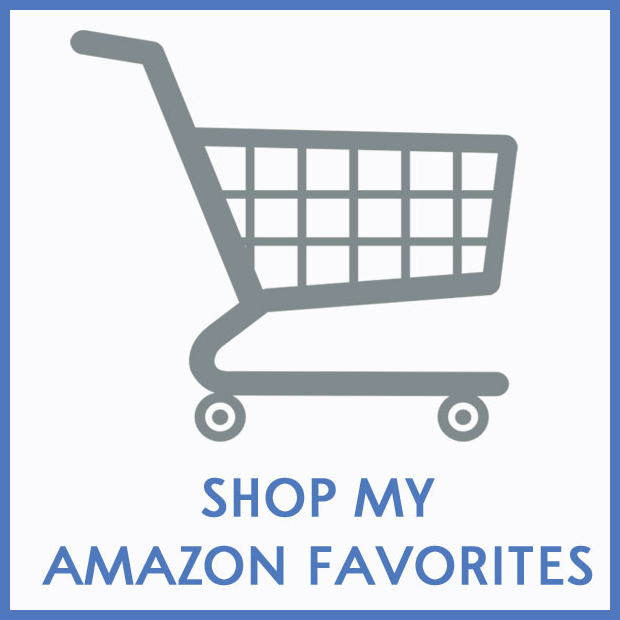 All of this while I am trying to keep content on my blog, keep up with social media, make sure the shop stocked, keep up with all of the articles I have due, get orders shipped, answer reader questions, and do book signings. 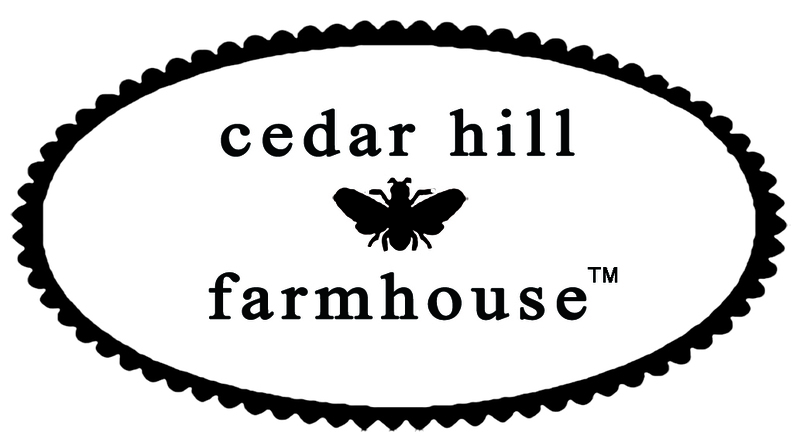 Then we had an unexpected trip out of town last weekend for some family business. Add to that a serious issue with my blog that I had to deal with until 2 am the other day, and I’m tired. I’m only sharing that with you, because I know you too have things going on in your life, and you probably don’t have a week to devote to Christmas decorating either. I know many people are going through difficult times and decorating is the last thing on their minds. All of that to say, do what you are comfortable with. It’s okay to do just a little or nothing at all if you just don’t feel up to it. And I’m in the middle of something new that is either super smart or super stupid. I’m still not sure which it is, but this thing has been very time consuming. I’ll tell you in a few weeks. As long as you have Christmas in your heart and your family by your side, the rest doesn’t matter Anita. I think you’ve done amazingly well considering all that is going on for you right now. 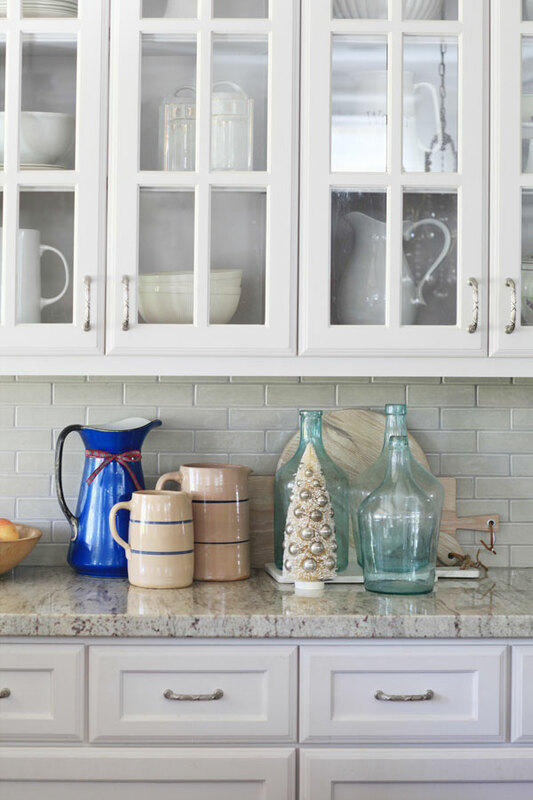 Your kitchen looks gorgeous and that tiny Charlie Brown tree is just too adorable!! Pinning and sharing. Merry Christmas! 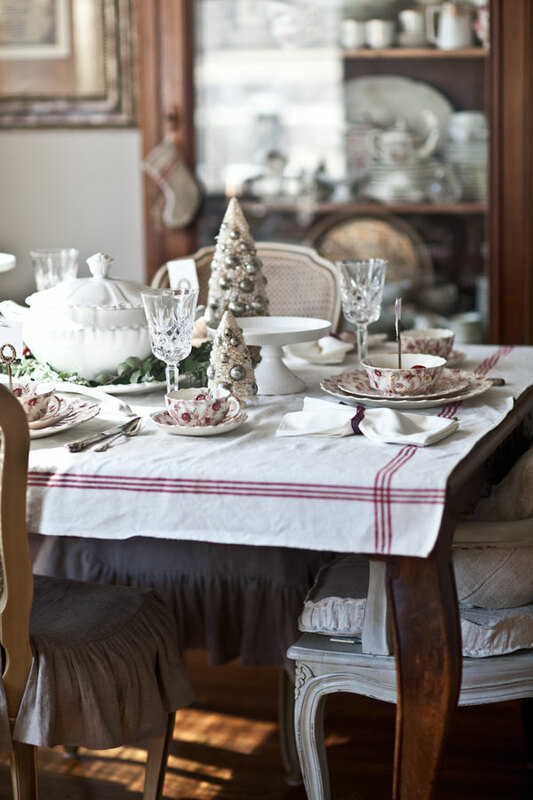 Anita, beautiful table and Christmas touches. I don’t know how you are blogging at all. So sorry about your mom. Hope she is okay and feels better soon. Wish I was close by to help you out! I am so sorry to hear about your mom!….My thoughts and prayers are with her and your family Anita. It sounds like you truly need a Calgon Bath so hopefully the tub will be fixed soon!….Now, with all that, you managed to set a gorgeous table with my favorite dishes!…Everything is just so beautifully dressed for Christmas…Hang in there!…from what I know, you are a very strong person and your strength is so admirable…Have a great day! Simple is perfect. Your beautiful home is always my favorite and your Christmas decor just enhances it’s beauty! Still praying for your mom! So lovely as is everything you touch Anita!! Seeing your rosebud chintz made me very happy… it is beautiful! I am looking forward to all the inspiration to come from you in 2016! Have a lovely Christmas season. I am off to check out all the other blogs on the tour today and gearing up for my turn on Friday!! 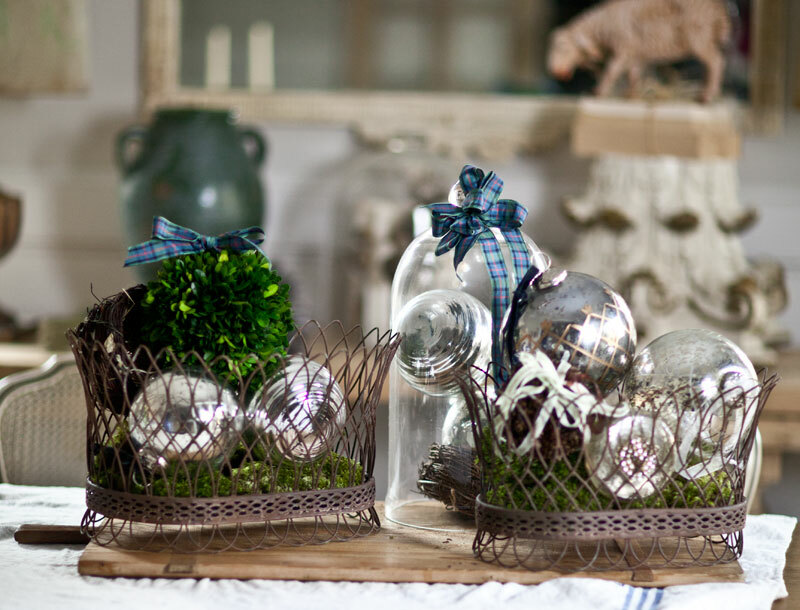 Your home is looking fabulous for the holidays. Your Christmas table looks perfect. 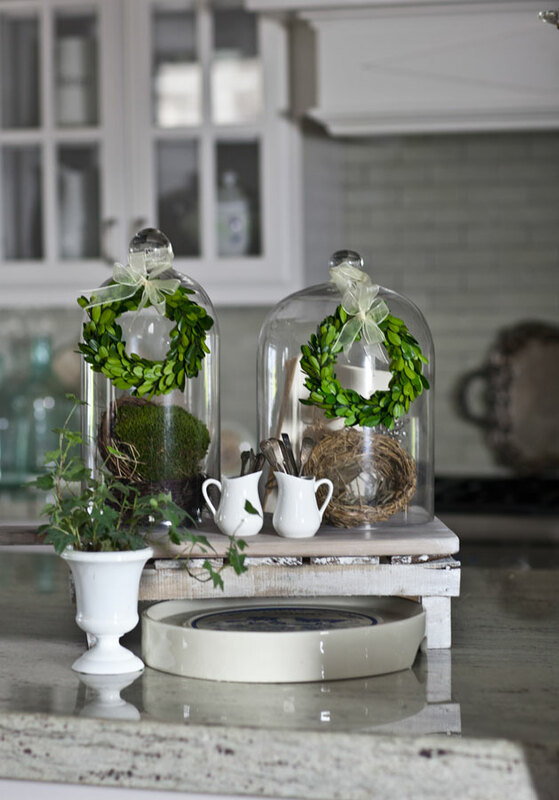 I especially like the cloches with the little boxwood wreaths because I adore any miniature scene and these are especially pretty with the birds nests! Thank you Mary Jo. Sometimes I can’t decide what to say and what to keep to myself. I hope that the holiday decorating brings a little joy into your busy life. Seeing the photos has been lovely eye candy for me. 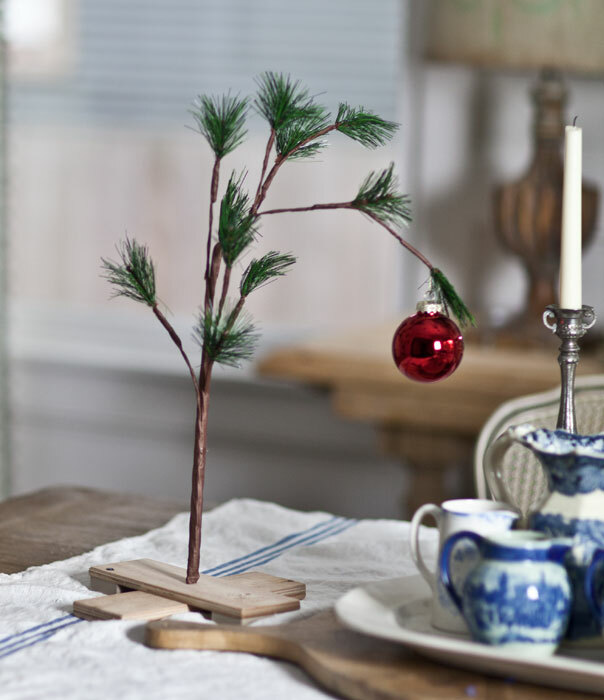 Oh, and I’m in love with that Charlie Brown tree! I hope you and your family get your tub / ceiling fixed and all things organized so you can enjoy each other! 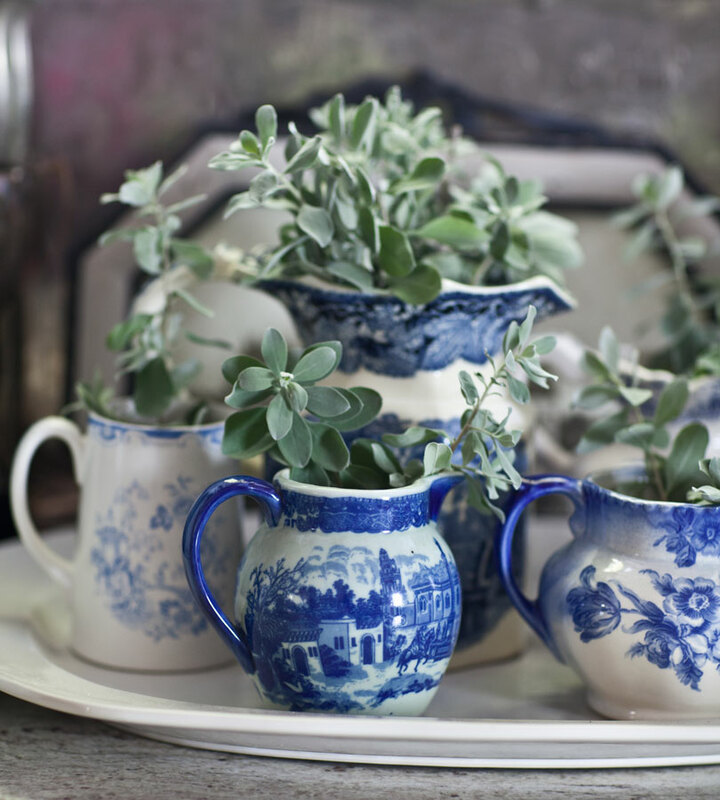 Love the greenery in your pitchers and the butter dish is to die for!! Happy Holidays! Everything is absolutely beautiful! 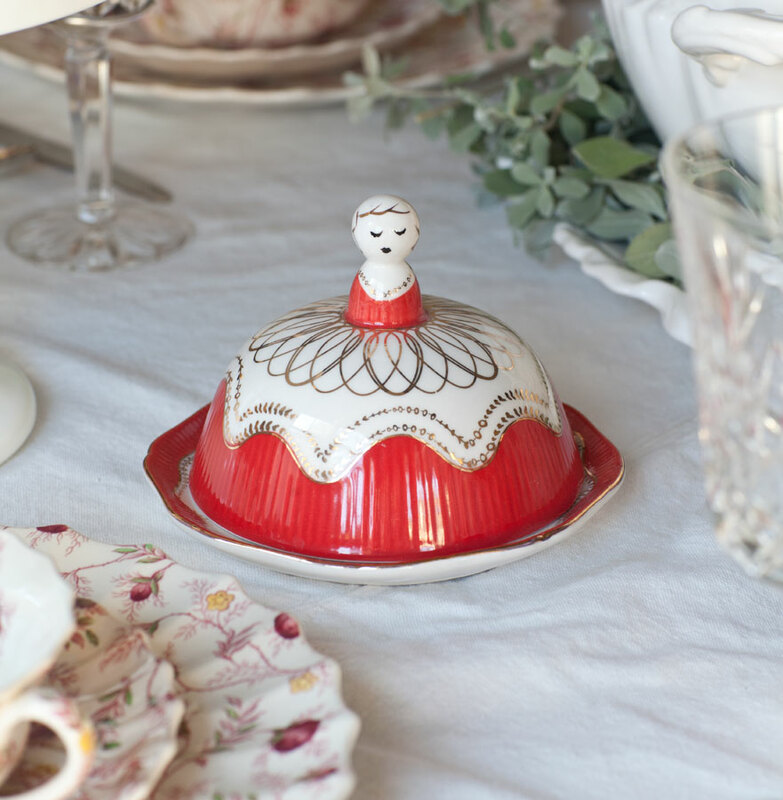 That butter dish is darling. My heart goes out to you, dear friend!!! I’ve had a Christmas, or two, like that. . .and I know how very tiring they can be. During those trials, I tried to stay focused on: are we fed? are we clean? call a friend to pray with and for me!!! Do what’s important and leave the rest for another day. . .another year!!! Spending time with your Mother, daughters and husband definitely take ‘top’ priority!!! Now. . .I love the little Christmas touches in your kitchen!!! I haven’t done any decorating in the Galley Style Kitchen, as function is the name of that game!!! But, I will add a touch before Christmas Day. .. just because!!! Know I’m holding you close to my heart, in my thoughts and my prayers!!! 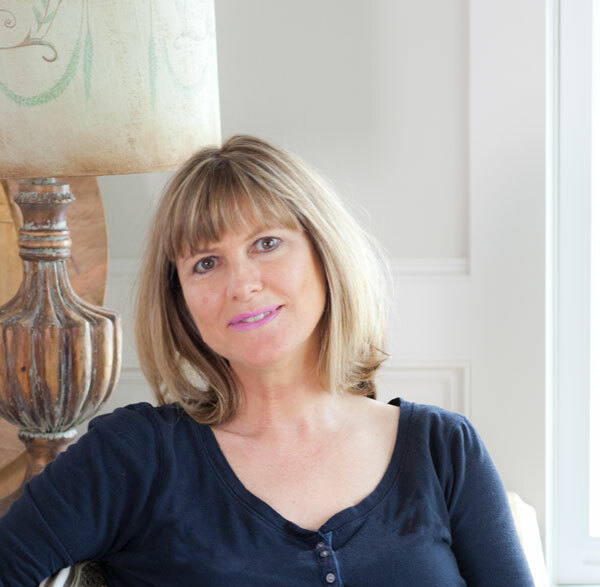 Love all of your gorgeous decor ideas Anita! I’ll keep you in my heart and thoughts – big hugs friend! Love everything you have done and it is all just beautiful. I well understand busy and I am sure just about everyone does anymore. Thoughts are with you, regarding your Mom – difficult days. Stay in the fight with all that is going on in your life – YOU WILL WIN! Everything is lovely. Can you tell me the name of your dinnerware? They are very different. I adore them. Have a a Merry Christmas. 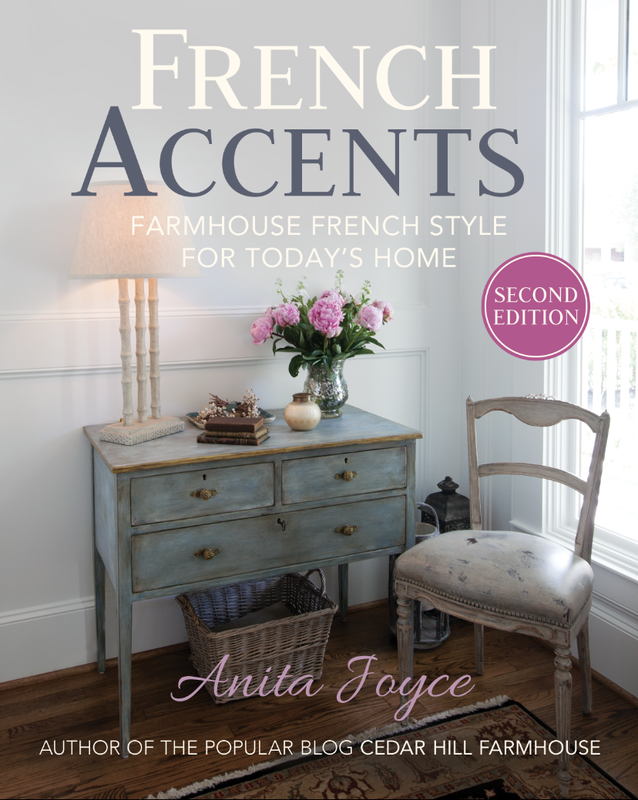 Hi Anita – Everything looks beautiful and inviting! 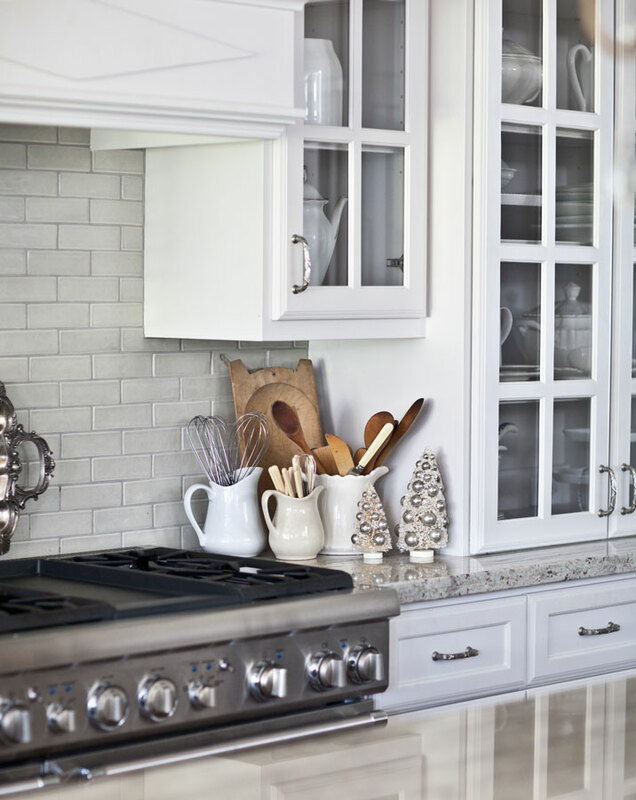 Can you tell me what the granite color is in your kitchen? I love it! Looks great ! 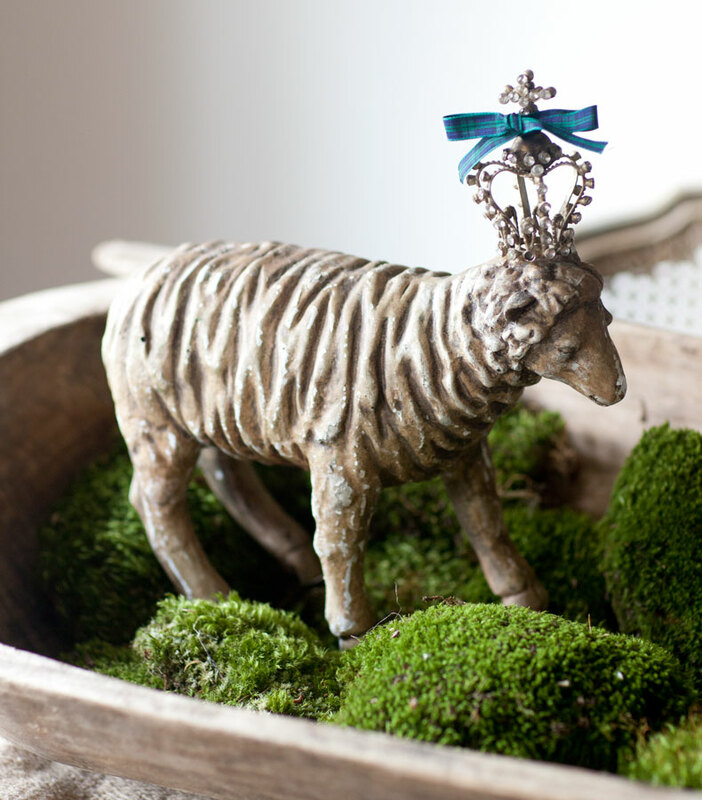 Love your decor! Love the kitchen decor. Hope you and your fsmily have a lovely abd peaceful Christmas. It seems it all happens at once, you ll get through it! Spend as much time as you can with mom and your family. The decorating is beautiful and of course so creative, but family is first. Don’t be hard on yourself and take each challenge day by day. Remember to take time for yourself. 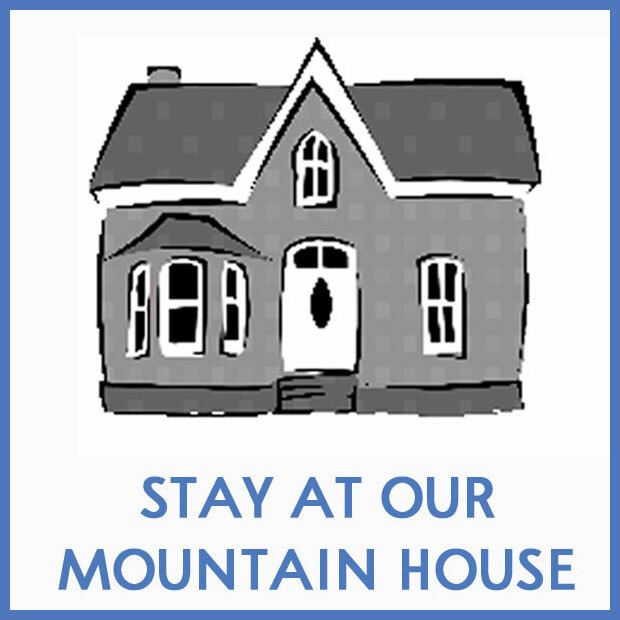 Enjoy your family and beautiful home and we will still be hear supporting you.